A home is made by adding personal touches that express our style in a completely unique way. Interior design is built upon individuality; as every home should reflect the family or person living within it. However, it can be difficult to find good quality furniture that isn’t mass produced and doesn’t come with a huge price tag –especially in Dubai! Customised furniture is, therefore, a design solution. The value of a custom piece comes in many forms, from filling an empty space to serving a purpose and pulling together a vision, customisation creates what you need for your home, in style that is truly unique to you. Unique designs don’t have to mean high costs. New Evolution pride themselves on being able to produce unique pieces that won’t be seen in your neighbours home, for a cost that is less than high end shops and brands you find in the mall. The interior design and fit-out service in Dubai create customised furniture that is manufactured in-house, using the highest quality European materials –designing and constructing affordable pieces. New Evolution makes things personal –from their process, to how they create the perfect space for your lifestyle, everything is uniquely designed for you. So it’s no surprise that the home décor service is an expert at custom made furniture in Dubai. They can build an entire project centred on your main décor characteristics, whether it’s colours, fabrics, textures or materials. New Evolution captures the needs and style of you, and your home, to produce pieces that last and hold their value. Remember, a custom piece from New Evolution also saves you the time of sourcing something that just isn’t out there. Customised items need to be functional, as well as aesthetically pretty. Think inventive storage systems or adaptable furniture that can transition a space seamlessly –there are some many options when it comes to custom made designs. 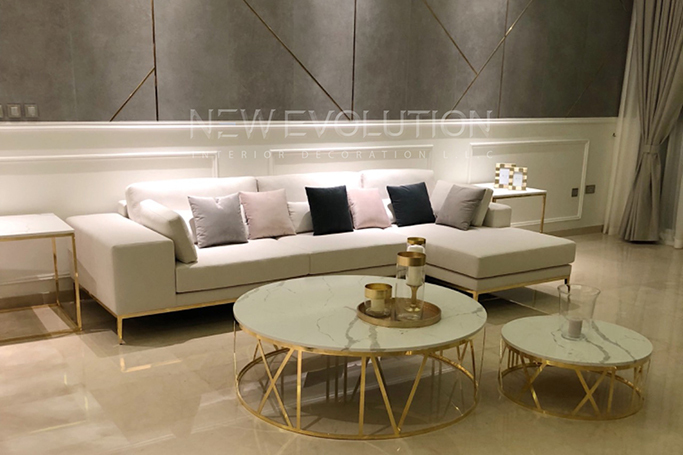 New Evolution are professionals at joinery and fit out in Dubai, from personalised wardrobes to vanities and shelves, they can produce something that is functional for your lifestyle and home.